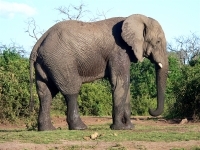 The largest land animals on Earth, African elephants are slightly larger in size with larger ears than their cousins, the Asian elephant. An elephant’s ears radiate heat to help cool them. Both male and female elephants have tusks used for digging food and water and for stripping bark from trees. The ivory tusks are valuable to humans who have killed many elephants for their tusks. Although this trade is illegal, many elephant populations remain endangered due to poachers. Vegetarians, elephants eat up to 300 pounds a day of roots, grasses, fruit, and bark. They do not sleep much but travel great distances foraging for the large quantity of food they require daily. Females elephants (cows) give birth to a calf once every 2-4 years. Pregnancy lasts up to 22 months with the young living with the females in family herds while the males (bulls) roam on their own. Buy an Eye and help save the African Elephant.